Start by placing the chicken in a 6-quart slow cooker, in the center. Next add the green beans on one side. Then for the potatoes, you will need to mound them high off to the other side. In a medium sized bowl, whisk together the lemon juice, olive oil, oregano, salt, pepper, onion powder and garlic cloves. 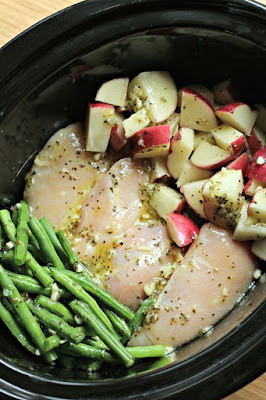 Pour this mixture evenly over the chicken, green beans and potatoes.